Fig. 1, Bank of N.S.W. 20 Spanish dollar note 1824, image, Coinworks. 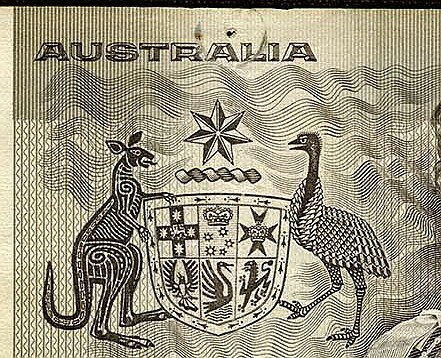 2018 was the busiest year EVER for the sale of Australian banknotes. The most expensive item offered in 2018 was an 1824 Bank of N.S.W. 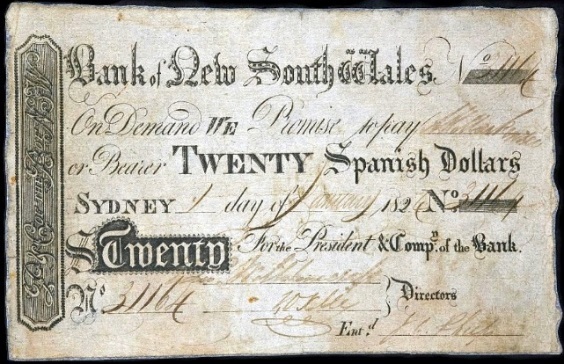 $20 Spanish note (Fig. 1) in good Fine condition with a dealer asking price of $295,000 in October, increased to $350,000 in November. In May the previous year the asking price was $495,000. Several German New Guinea notes averaged around $42,000 each (plus buyer’s premiums on all auction prices quoted). About 25 promissory notes were advertised with very high pricing, most having carried over from the previous year. There were around 45 Hay Internment Camp notes in auctions as well as 280 private bank notes and 30 superscribed notes. Fig. 2, emergency E.S. & A. £1, image, Dauer collection, Heritage Auctions, U.S.A.
Four of the red numbered Collins/Allen £1 (R18a) were seen with the highest auction price being $6,672 and highest dealer price $47,500. Three of the rare emergency E.S.& A. £1 notes (R19) not seen in some years had prices ranging from $16,000 to $40,000 (Fig. 2). Fig. 3, rainbow £1, D No. 000001 D, image, Noble Numismatics. In the Rainbow pounds there were three and five of each variety with the highest auction price being $102,000 for serial number D 000001 D (R.20a Fig. 3). Fig. 4, contemporary forged non-mosaic £5, image, Noble Numismatics. Four of the nine non-mosaic £5 (R35) offered were contemporary forgeries, one of which auctioned for $470 (Fig. 4) A note with the same serial number appeared on eBay the following month for $39,000. One way to identify these forgeries is the clarity of the printing. Fig. 5 is from the back of a forgery and Fig. 6 from the back of a genuine note. Fig. 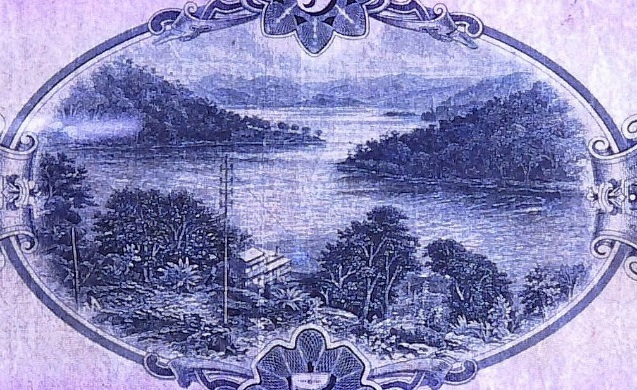 5, scene on the back of a forged £5 note, image, Noble Numismatics. Fig. 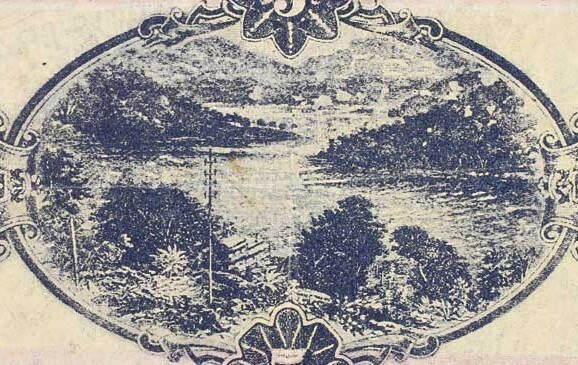 6, scene on the back of a genuine £5 note, image, author. Three of the four scarce Riddle/Heathershaw Note Issue Dept. £5 notes sold from $8,200 in repaired about Fine condition to $16,680 in VF condition. 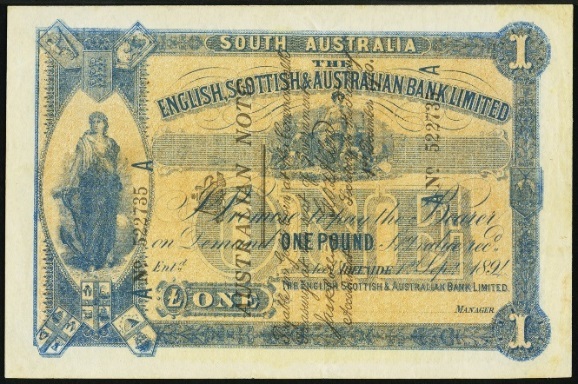 Five Collins/Allen £10 (R51) were seen with the highest price being $34,000. Three of the rare (R52a) Cerutty/Collins £10 with Collins/Allen back colours appeared, with the best selling for $24,000 in good Fine condition. Eight £20 notes ranged from $25,000 to $58,380 at auction to dealer asking prices around $90,000 and an early £50 note (R67a) sold for $48,000. The highest auction price for one of five £100 notes was $60,000. Fig. 7, accidental release zero 2006 $5 note, image, Edlins Auctions. About 30 charity auction 000000 notes were sold, including a 2006 $5 note from the “not sold” list for $1,500 that was an accidental release not recognised as such in two successive auctions (Fig. 7). 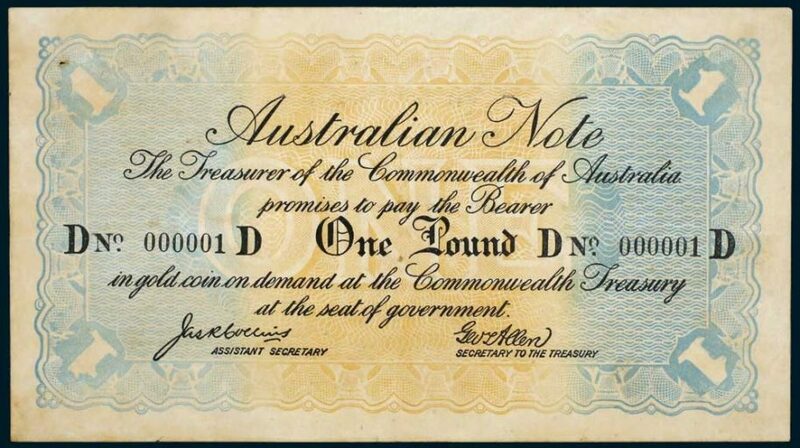 Downies have advertised similar notes in the past for more than $10,000 each. Fig. 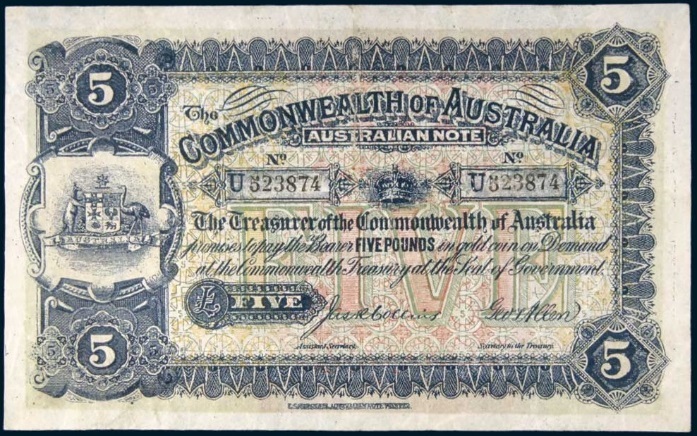 8, punch-cancelled $1 note. A holed cancelled $1 note (Fig. 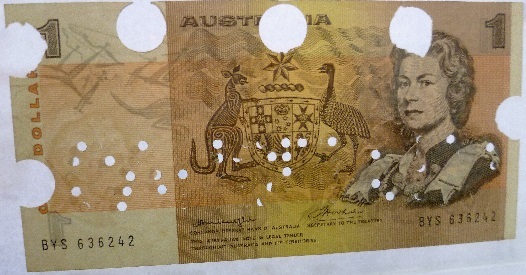 8) was given to a bank employee by workmates on his retirement around 1976 (such an act is technically illegal as it is an offence to deliberately mutilate a good banknote) which was offered on eBay for $4,500. Fig. 9, believed sun-faded $1 note, image, I.A.G. 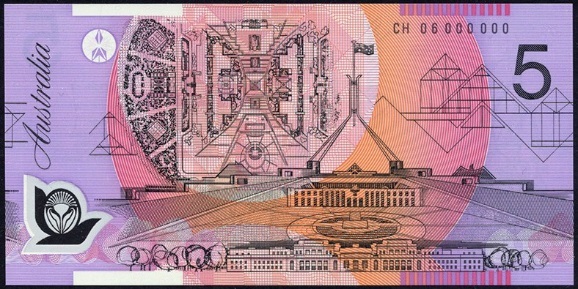 Errors did well with notes missing intaglio print fetching up to $2,000 and notes without Simultan printing up to $2,200, although I believe a $1 note auctioned appearing to be missing the Simultan printing on the front was faded from excessive exposure to sunlight, indicated by a drawing pin impression at top centre (Fig. 9). All other known $1 notes with missing Simultan print have occurred on the backs.